The TRITON-TX28S is the lowest cost module in the TRITON-TX family, and is only available in commercial temperature spec. (0C to 70C). A version of the module based on i.MX287 with industrial temperature spec. as well as dual Ethernet, 128MB RAM, CAN, and other extended features is also available. TRITON-TX28S includes a comprehensive set of peripherals and interfaces. These include USB 2.0 Host and OTG, a 10/100 Ethernet port, SD Card, two UARTs, 800×480 capable LCD controller, I2C, I2S, SPI, and GPIO. In addition there are 8 analog inputs (5 are used for resistive touch). Linux support for TRITON-TX28S is provided by a mainline Linux 3.x BSP, which means that support is maintained at the latest embedded Linux version, which allows users to leverage support and application compatibility from the open-source community. TRITON-TX28S also features an optional comprehensive Windows CE 6.0 BSP. 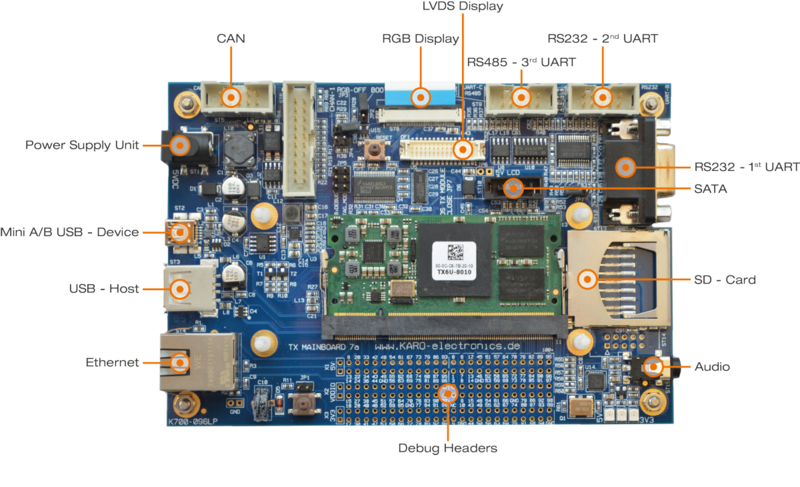 Mainboard-7 provides a complete development environment based on TRITON-TX28S, running mainline Linux or Windows Embedded CE 6.0 out-of-the-box. 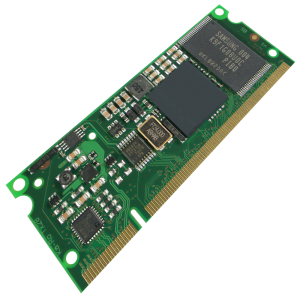 The development system consists of a baseboard which provides an unpopulated bank of 0.1″ headers for all 200 module pins, plus connectors for all the main module interfaces, and includes additional peripherals such as an SGTL5000 audio codec. Other connectors include USB, Ethernet, SDCard, CAN, RS-232 and RS-485. 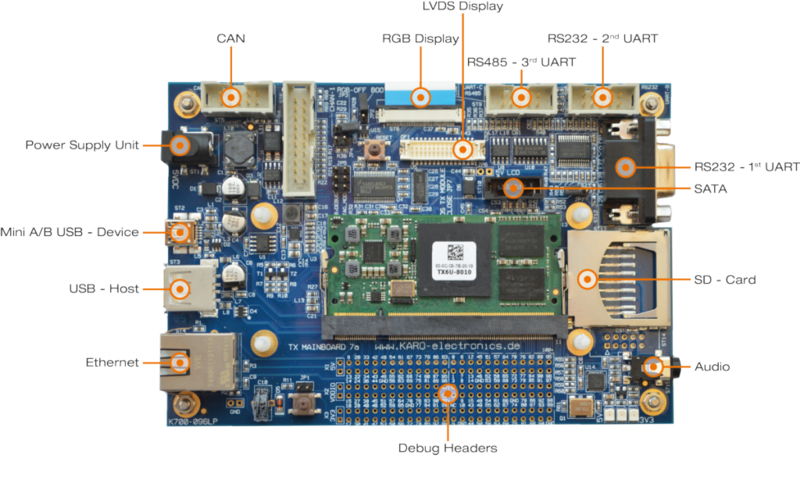 The Mainboard-7 offers an optional 640×480 capacitive touch screen, and an LVDS output to enable connection of other screen sizes. For production purposes, you will require a custom baseboard, and we are happy to offer baseboard design and manufacture as a service. Purchase this kit online, for next day delivery – simply click the “Buy Online” link opposite. There is a single SKU of TRITON-TX28S with 64MB RAM and 128MB NAND Flash – maximising our opportunity to maintain inventory of this popular product for customers. Simply order the Mainboard-7 for TRITON-TX28S development system via our online shop, and it should be with you the next working day. We look forward to providing you with knowledgeable, professional support to create your product. If you have questions, please don’t hesitate to contact us by calling Direct Insight on +44 1295 768800 9am to 5.30pm UK time, emailing info at directinsight.co.uk, or by using the “Ask a Question” form below. Contact our experienced team with your detailed questions – we’ll be happy to help. Detailed pricing depends on volume and configuration – simply follow the “Get Quote” link opposite, and you will be mailed that information by return. Development kits can be ordered from the online shop, or by contacting us if you would prefer to receive a quotation.